Well, I wanted to write a heartfelt and inspiring new year’s message, one that summed up this crazy year and offered sparks of hope for 2019. Despite the madness emanating from the “very stable genius” in the White House and his enablers, despite the increasingly dire consequences of climate change, there is much for which I’m grateful. That includes my family, a beautiful and supportive place to live and meaningful work as an artist and haiku poet. evening stars . . .
Consequently, I don’t have the energy to write much today. So let me just cut to the chase: thank you for supporting my art, and here’s wishing you all the best for the new year! 2019 calendar of art and haiku: Could you use a small 2019 calendar which serves as a rotating monthly art show? I’ve still got a few in stock! Thank you cards: With the holidays over, it’s time for thank you cards! 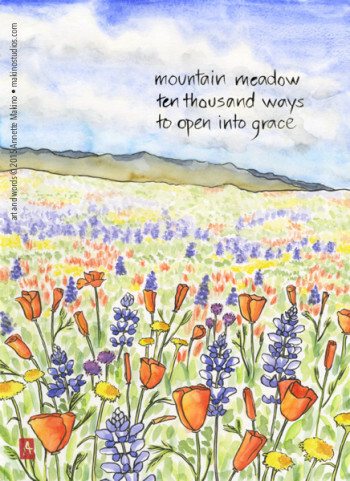 I offer boxed sets of eight sweet little wildflower notecards with kraft envelopes. Humboldt County is famous for two things: its magical old-growth redwood forests and perhaps equally magical marijuana. But there is a lesser-known feature that makes this area unique: it has more working artists per capita than any other part of California. Each year in June, some 150 Humboldt artists open their studio doors to the public as part of North Coast Open Studios. Earlier this month, it was my pleasure to be part of the "Seven in Samoa" group that hosted visitors the first weekend. The following weekend, I got to tour nine studios. In visiting other artists, I was inspired and moved by much of their art. But it was just as interesting to talk with these working artists and learn about what goes on at the other end of the paintbrush. I discovered we are grappling with some of the same issues. A common theme of our conversations was the tension between making art that purely expresses our creativity versus making art that we know will sell. For instance, one artist is currently drawn to images of melancholy women, but knows there is a much bigger market for her playful pieces of cats. Another sells a lot of art postcards with inspiring quotes, but her passion project is a scrapbook of sketches and thoughts about silent meditation retreats, though she knows the market for such a book is very limited. Annette Makino demonstrates her tools and techniques at the Samoa Women’s Club in Samoa, CA as part of North Coast Open Studios in June 2017. Another common theme of my Open Studios conversations was the competing demands on our time: we need to spend time managing and marketing our business, but that cuts into the time to actually create. And it's hard for me to compartmentalize: when I know I have orders to fill or an event to publicize, I can't get into the open, spacious frame of mind I need to paint. Finally, an underlying issue that emerged from talking with other artists was, what does success mean to me as a working artist? Is it measured by sales? Reputation? Appreciation from buyers? Personal satisfaction from the joy of creating? While it’s surely some combination of all of these, it’s challenging to find the right balance, especially in a culture that confuses money with worth. Overall, I came away from Open Studios without clearcut answers, yet comforted to know that I am not alone: even the most successful artists struggle with these dilemmas. It was inspiring to meet so many passionate, committed people who have chosen to walk this sometimes difficult path. We may never get rich from our art (though I'm not opposed to that! ), but we are certainly rich in spirit. summer solstice . . . Seven in Samoa: The Eureka Times-Standard ran this story about the group of artists that showcased our work together as part of North Coast Open Studios. Summer vacation: Happy solstice! I’ll be on vacation from this Saturday, June 24 until Sunday, July 2. While I am swimming and painting at the Klamath River (depicted in the above image), my Makino Studios Etsy shop will be closed for the week and I will not be filling store orders. Westhaven Wild Blackberry Festival: Rabia O’Loren will be selling a selection of my cards and prints at this festival on Sunday, July 30, 10-4 at the Westhaven Volunteer Fire Department. North Country Fair: Mark your calendar for this two-day festival celebrating the fall equinox, taking place September 16-17 on the Arcata Plaza! Popping up in the middle of National Poetry Month, today is International Haiku Poetry Day. To mark the occasion, here is a smorgasbord of haiku I’ve published this past year. Enjoy! And for a selection of some of the finest haiku of 2016, see the short list for The Haiku Foundation’s prestigious Touchstone Award. Free shipping for Poetry Month: Since April is National Poetry Month, I am offering free shipping for US orders of $15 or more through the Makino Studios Etsy store. Use code SPRING2017 through April 30.
ukiaHaiku Festival: I will be at the ukiaHaiku Festival in Ukiah, California on Sunday, April 30 at 2 p.m. at the Civic Center in my old hometown of Ukiah, California. Stay tuned for some happy news! BeeFest 2017: This annual celebration of bees takes place from 10 a.m. to 5 p.m. on Saturday, May 13 at the Adorni Center in Eureka, California. A sampling of my cards and prints will be available. Open Studios: Mark your calendars for North Coast Open Studios! Once again, I will join silk painter Tina Gleave, plus five other women artists, at the Samoa Women’s Club in Samoa for the first weekend. We’ll kick off from 6-9 p.m. on Friday, June 2 and continue from 10 a.m. to 5 p.m. on Saturday and Sunday, June 3-4. We’ll be showing new art, demonstrating our tools and techniques, and offering free refreshments. Besides a grand family adventure, my trip to Japan earlier this summer (see Journey to Japan) was also an exploration of Japanese art and haiku—and a chance to stock up on hard-to-find art supplies. A major highlight of the trip was a visit to a famous art supply store in Kyoto, founded by a painter in 1863 and still run by his descendants. At the one-room Saiun-do (“Painted Clouds”), I found the fine brushes, made of weasel hair and bamboo, for which I had spent years searching. I also scored a fragrant new sumi ink stick and several ceramic pots of special "gansai" watercolors that are found only in Japan. Later, I painted the Japanese maple leaves shown here with my new brushes, delighting in their smoothness on the page. How liberating to find brushes that work with me, not against me! Through sheer serendipity, I was able to see woodblock art prints by one of my favorite artists, Hiroshige, at four different museums around the country. Ukiyo-e (literally, “pictures of the floating world”) were hugely popular in the Edo period, when the merchant class enjoyed decorating their walls with prints of beautiful geisha, kabuki actors and landscapes. "The Great Wave off Kanagawa" by Hokusai is probably the best-known example of ukiyo-e in the West. It is estimated that in the 1850s, four to five million ukiyo-e were printed every year! The visual style, in which thin black outlines were filled in with blocks of color, was the forerunner of manga (Japanese-style comics). It also deeply influenced the beautiful anime (Japanese animated films) by director Hayao Miyazake, among others. 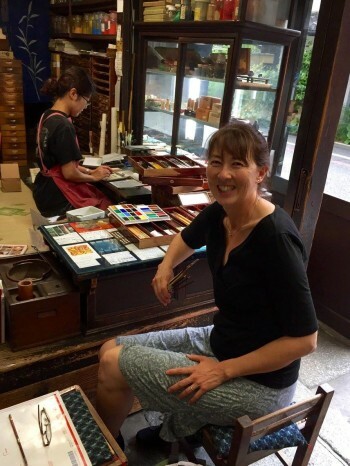 Annette Makino buys Japanese art supplies at Saiun-do in Kyoto, Japan in June 2016. But it was only on returning home this summer that I realized how much my own art owes to ukiyo-e. Though painted on paper rather than carved into wood, my paintings typically consist of thin outlines of black sumi ink that bound areas of color. And my art, like Hiroshige’s in his day, is mainly intended to be printed and enjoyed by many, rather than hung in fine art museums. I came to Japan to study the old masters—and found a part of myself. North Country Fair: Humboldters, come celebrate the fall equinox at the 43rd annual North Country Fair on the Arcata Plaza this Saturday and Sunday! The fair runs from 10 a.m. to 6 p.m. both days. There will be 170 art and craft vendors, three music and entertainment stages, local food booths, activities for kids, and a daily parade at 1 p.m. Come visit my Makino Studios booth on G Street near Moore’s Sleepworld! New2017 calendars: For the fourth year in a row, I have created a mini-calendar of my art and haiku. Featuring animals, landscapes, and other scenes from nature, the 2017 calendars have just come off the press and will debut at the fair. They can also be ordered through the Makino Studios shop on Etsy. New keychains: I have designed two different wooden keychains featuring my art and haiku, one of a playful dog and one of a Humboldt redwood. These laser-engraved keychains will be offered at the fair this weekend and are also available on Etsy. 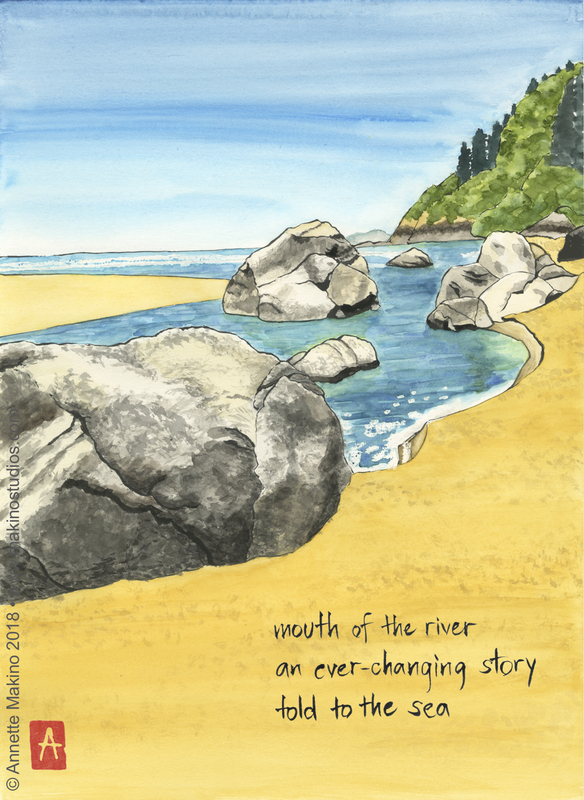 New card designs: Heirloom tomatoes, redwood forests, and river landscapes are the subjects of some of my latest greeting cards, due off the press this week. Check them out at the fair or the Makino Studios Etsy shop. Seabeck Haiku Getaway: This fun and inspiring haiku retreat takes place Oct. 27-30 in Seabeck, Washington next month. I will be presenting on my trip to Japan with photos and haiku. I look forward to playing and learning with other haiku poets in a beautiful natural setting! After the exercise, my daughter Maya and I compared lists. I definitely don’t share her dream of working a stint as a bartender! But it turns out that we both had the exact same number one wish: to travel to Japan as a family. Meanwhile, Makino Studios turned five years old in March. Thinking about how to mark this milestone, I remembered the bucket list exercise. 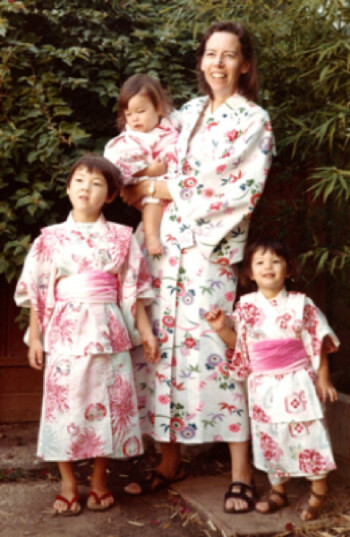 It occurred to me that the best way to celebrate would be to use some of my earnings to take our family to Japan. How fitting that a business that draws deeply from the traditions of Japanese art and haiku would enable us to travel there. So we are off early next month for three weeks of exploration and adventure! This will be the first trip to Japan for our teens; it is the fourth trip for me and the second for my husband Paul. My sister Yoshi will join us for the first and last few days of the trip. Our itinerary includes visiting Japanese relatives in Tokyo and touring the venerable 320-year old Makino sake factory in Takasaki. We’ll also see the Makino temple and a cemetery there containing family tombs from ten generations. I’m also excited to hike along the ancient Nakasendo trail in the Japanese alps, where stone tablets commemorate visits by revered haiku poets Basho and Shiki. We will soak in hot springs and explore Japanese temples, gardens, castles, and museums. To experience Japanese life more deeply, we will mainly stay in ryokan (traditional Japanese inns) and a variety of homes booked through Airbnb. As lovers of Japanese cuisine, we are especially excited about the food! I imagine I’ll find much artistic inspiration throughout. While the earnings from my art business are modest, the psychic rewards are incalculable. (I just don’t think I’d feel the same about bartending.) To all my store buyers, customers and supporters over the past five years, I bow in thanks. Newest stores: The list of Makino Studios card retailers now includes Down to Earth in Eugene, Oregon; Three Sisters in Ukiah; and Swish Healdsburg in Healdsburg, California. If there is no store in your area, you can order online through my Etsy shop. Order by June 1: As I’ll be traveling in Japan, I will not be able to fill online or store orders between June 2 and June 28. Connecting: I appreciate the kind responses to my last post, on International Haiku Day. 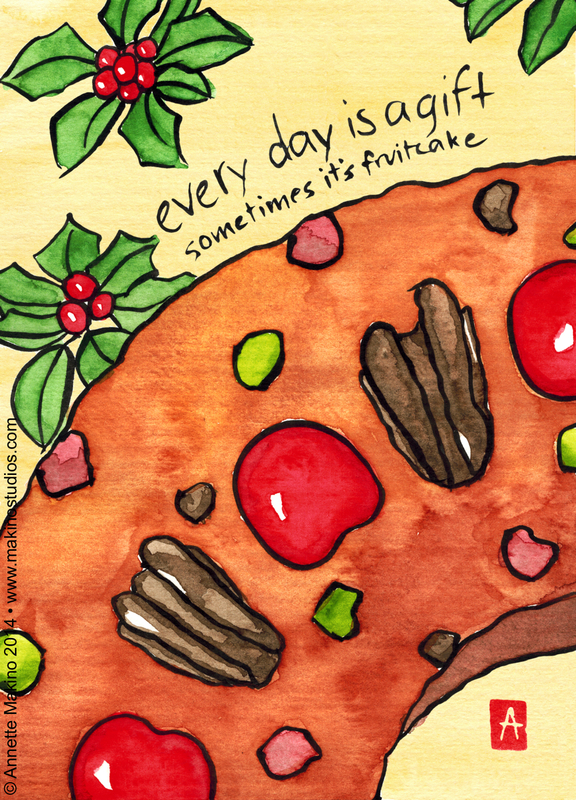 You can get news, fresh art and haiku on my Makino Studios Facebook page and my Twitter feed. Publication credit: “salt breeze” was published in Exhaling, the Seabeck 2015 anthology; it tied for second place in the Seabeck kukai (a haiku contest determined by participating poets).